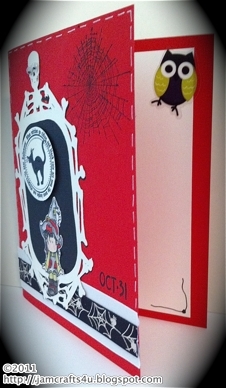 We have been enjoying crafting and making cards so much lately! Spending time up in the craft room and burning the midnight oil, stamping, gluing, stickling, and embellishing everything we get our hands on! This is a Bugaboo digital stamp called, "Halloween Brat Witch." I colored her with Prisma colored pencils and used The Cricut Cartridge, Happy Hauntings for the skeleton frame. 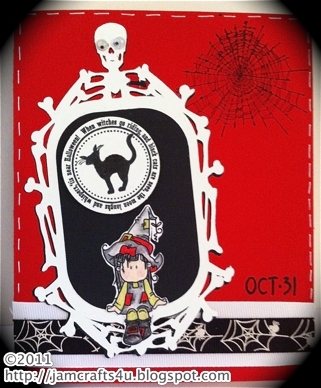 The sentiment and cat stamp is from Paper Trey Ink 2009 Halloween Tags Stamp Set. Paper Cutz Challenge - "Shake Rattle & Roll"
Simon Says Stamps Challenge - "Anything Goes"
4 Crafty Chicks - Challenge #57 - "Anything Goes"
Forever Night - Freaky Friday Challenge #11 - "Anything Goes"
I think I will soon have the same problem as you - I am spending more and more time in my craft room but I love it so much! I sometimes wish I could give up my day job and hide in my craft room forever :D but then I would have the same problem of noone to send things to! Look forward to seeing more of your fab creations! 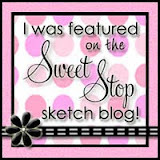 Looooooooooooove the card & thanks for following my blog! Such a cool skeleton frame. Great job on the coloring too.Thanks for playing along with us at Paper Cutz. 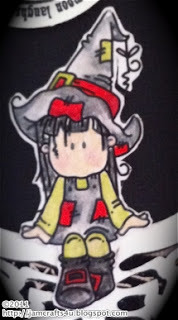 Hi guys thanks for popping by my blog and becoming a follower too and good luck with those challenges. your cards are just my style straight to the point and not too fussy keep up the good work. You will always have me!! And you can lock me away in the Craftin Studio with you! I won't mind. 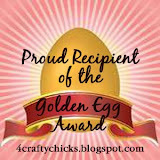 This is so wonderful thanks for playing our Anything Goes Challenge at 4 Crafty Chicks! WTG! Lisa... we are ready for another crafting lock-down! Leanne... thank you so much! This is a fantastic card. I love the way you designed it. Thank you so much for joining us this week for our "anything goes " challenge over at Forever Night Challenges. I hope you have a great week and Good luck. Thankyou so much for your gorgeous entry for this weeks Simon Says Stamp Challenge and for helping us get over 1000 entries ......good luck!!!! Thanks Shannin and Marcea! Having a wonderful time joining in on your challenges! Thanks for all the work you ladies put into those! Cool card. Nice design & colors. Thanks for joining the Paper Cutz Challenge. We are 2 North Carolina girls raised on sweet tea and country cooking. We are proud owners of a thriving small business that affords us the opportunity to express ourselves in various crafty ways. We enjoy traveling, gathering with family and friends, and spending time at home while watching our kitties play tug-of-war with a stretch of yarn. We are always on the prowl for new and innovative techniques for our crafts. Scrapbooking was our initial step into the creative world... and now our we are full blown "craftheads" ... stamping, cutting, cricuting, gypsying, sewing, copicing... you name it... we love it!